Measurements: 3.2 x 4.75 inches, or 80 x 120 mm. Back of card: Light gray field, white border. Gray on gray: A "WS" top & bottom. Over that, what looks like the Tree of Life fancied up with four pairs of yellow wings & green & orange spheres. Can be inverted. Publisher: US Games. Printed in Belgium. "The distance between what human beings can understand and the unknowable mysteries of the divine is enormous. In spite of this seemingly insurmountable gulf, humanity has spent its existance reaching into the unknown, trying to grasp the infinite. And, one might speculate, the infinite has tried to reach back to communicate with our limited minds. When two things reach across great distances, bridges are formed. This booklet relates to the bridges between humankind, tarot and angels"
The introduction then goes on to say that both angels & the tarot are very old & mysterious things. 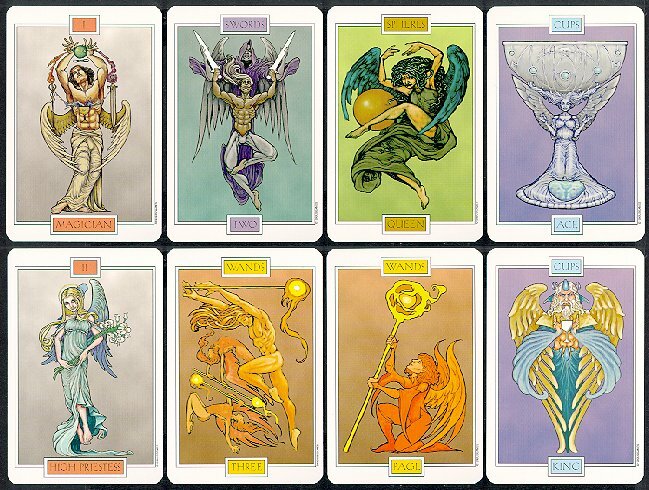 Each of the cards in the major arcana represents a particular angel, it's a pity they didn't put the names directly on the cards. The Magician is Metatron, the High Priestess is Gabriel in her feminine guise, etc. The pip cards of minor arcana have the same meaning as usual, except there's an unidentified angel thrown in for good measure, which we think is a poor use of the concept (see our notes on white horses with horns in the Unicorn Tarot, another designer tarot). Knights are unnamed warrior angels. It's a pity the angels aren't named as all angels in this class have names. The other court cards are not identified as angels in the booklet, but if they've got wings, angels they must be. Anyway, for you designer tarot enthusiasts, another very nice deck. David Sexton has also designed the Tarot of Oz. Established 1993, The Astrology Center of America is owned & operated by David Roell. Except where noted, this entire site (AstroAmerica.com) & its contents are Copyright © 1996, 1997, 1998, 1999, 2000 by William R. Roell. All rights reserved. Tarot card images are Copyright © by the copyright holder (generally the publisher).